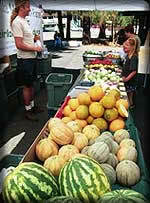 Kris Olsen of Cahuilla Mountain Farm in Aguanga sells melons, eggplant, squash and garlic. Southland Farmers' Market Association offers consulting services to public agencies and nonprofit groups that wish to start a certified farmers' market. These services are offered on a sliding scale depending on the resources of the organization and the community it serves. Southland can perform a feasibility study for developing a certified farmers' market in a particular location or community. Organizations or institutions considering a certified farmers' market would do well to have an informed evaluation of the plans for the market before committing the resources necessary to development a market. A Feasibility study is relatively inexpensive and would provide a careful assessment by our staff of the likelihood of success for a proposed market. Southland provides technical assistance to new and existing certified farmers' market organizers. These services can include developing a budget and business plan for the market, securing necessary permits and licenses, finding suitable insurance coverage, designing the market, recruiting growers, organizing a successful opening day, and many others. Please contact the Executive Director Howell Tumlin at info@sfma.net or call 805 845-6100 if you would like more information on the services that Southland may offer to your organization.